Skinny Bang Bang Sauce – a lighter version of the Bonefish grill favorite. 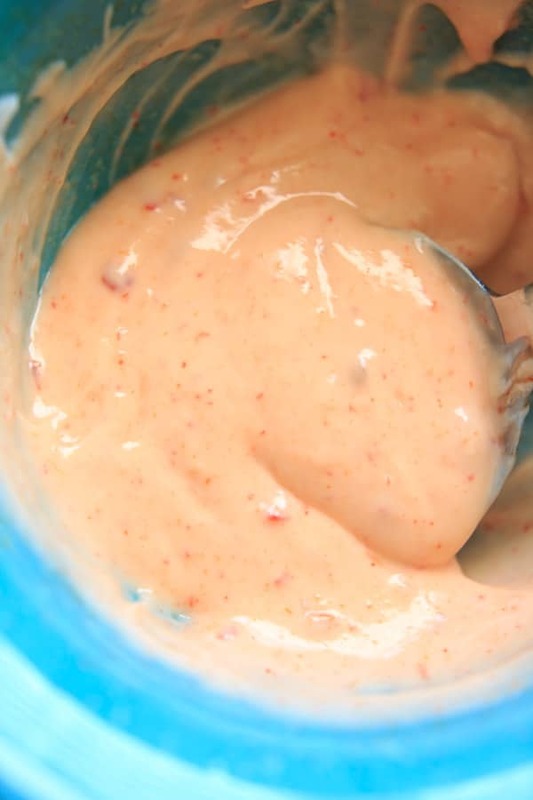 A great dipping sauce for veggies or seafood! 4 ingredients, 5 minutes, simple simple. I have a pattern of making things “skinny” by replacing mayonnaise with greek yogurt (just like in my recent pimento cheese recipe). Adding sweet chili sauce (I got mine at Trader Joe’s) and hot sauce (extra sriracha for the win) you can’t even tell it’s a lightened up version. The final ingredient is rice vinegar, which is optional if you don’t have it available (I tried it without at first), but I do think it gave it that little something extra. The recipe is very simple – 1/4 cup plain greek yogurt, 2 tablespoons sweet chili sauce, 2 teaspoons sriracha and 2 teaspoons rice vinegar. I of course added an extra teaspoon of sriracha to make it extra spicy, but depending on your preferences you can adjust it down or up as needed. Takes 5 minutes or less depending on how fast you are at measuring things. Skinny Bang Bang Sauce - a lighter version of the Bonefish grill favorite. 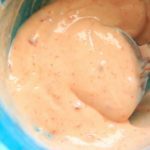 A great dipping sauce for veggies or seafood! 4 ingredients, 5 minutes, simple simple. Use as dipping sauce for Bang Bang Cauliflower, Bang Bang Brussels Sprouts or other veggies as desired. I don’t love fish, which makes sense why I have never tried this sauce – but I have heard of it! I can imagine it would be great on so many things and I love that it’s lightened up with greek yogurt! That’s simple and yummy. Healthier too! Pairs well with seafood. I love bonefish grill food so its nice to have this recipe. I couldn’t help but giggle at the name of this 😛 I’m the same and often replace mayo with yogurt for a lighter version. I often add a little lemon to mayo dishes but by swapping the mayo for yogurt I find I don’t need the extra acidity! Fish or veggies, this sauce looks delicious. I love how a simple sauce is so versatile and makes everything feel special! Thanks for sharing this delicious sauce in a healthier version of it! I’ll be following your recipe next time I’ll be making the sauce.